Yahoo's userbase has jumped 20% during Marissa Mayer's 15-month tenure as CEO. Yahoo can now hang onto a larger chunk of what many believe is its most valuable asset: hot Chinese e-commerce company Alibaba. Yahoo owns a 24% stake in Alibaba, which is preparing for an initial public stock offering. Yahoo revealed in its third-quarter financial report Tuesday that it will have to sell fewer of its Alibaba shares in the IPO than planned: It will sell 208 million of its shares instead of 261.5 million. Investors cheered the news, sending Yahoo (YHOO) shares more than 5% higher in after-hours trading. But those gains dissipated on a post-earnings conference call after Yahoo released lower-than-expected outlook for the current quarter. Yahoo CEO Marissa Mayer talked up her product-focused turnaround efforts that have propelled the company to 800 million monthly users. That's a 20% gain from the beginning of Mayer's 15-month tenure. Mayer often speaks of her goal to make Yahoo part of Internet users' "daily habits" again -- that is, create products that people "touch every day." In an effort to achieve that goal, Mayer has bought up nearly two dozen startups, eight of which were purchased during the third quarter. Mayer has also relaunched several of Yahoo's core products. Those product refreshes, including a new Yahoo homepage, mail, fantasy sports, weather, sports, news and Flickr, also include a deep focus on the mobile versions of those apps. Yahoo's mobile userbase soared 15% over the quarter to 390 million monthly users, Mayer revealed on a post-earnings conference call with analysts and press. Increased user engagement and page views haven't led to better financials for Yahoo, though. Yahoo's revenue -- excluding the portion of sales it hands over to advertising partners -- came in at $1.1 billion, down 1% from the prior year. Earnings excluding one-time charges came in at 34 cents per share, down 13% from a year ago. Both figures were in line with analysts' estimates. Yahoo expects sales for the current quarter to come in around $1.2 billion, which was slightly below the forecast analysts expected. 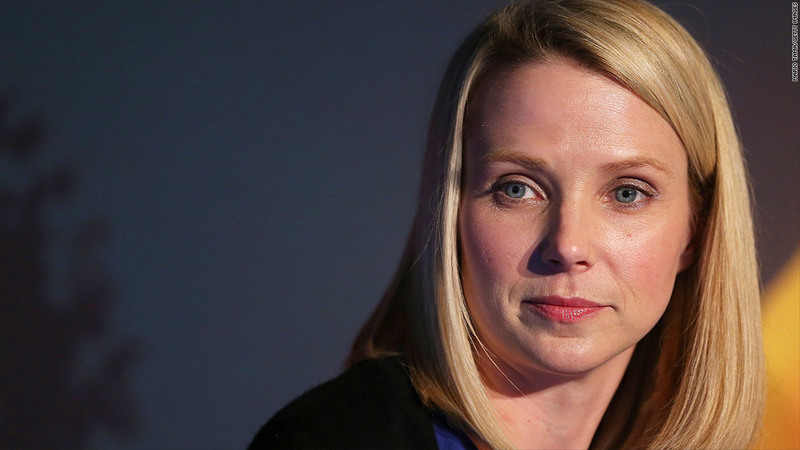 Still, Mayer said on the conference call that she considers Yahoo's revenue to be "stable." While Yahoo's overall financials are still far from growing, declines in some areas are beginning to slow or even to turn around. Sales for Yahoo's display advertising (banners and video ads) fell 7% over the year, but that was better than the 11% annual drop in that sector last quarter. The number of display ads sold ticked up by 1%, but the price advertisers paid for that content fell by 7%. The search side of Yahoo's revenue fared better. Search sales, excluding the portion shared with advertising partners, actually jumped 3% over the same quarter last year. The number of paid search clicks leaped 21% but the price Yahoo commanded for each of those clicks fell 4% annually. Yahoo rival Google (GOOG) will release its quarterly earnings this coming Thursday, and search partner Microsoft (MSFT) will announce its results one week later.